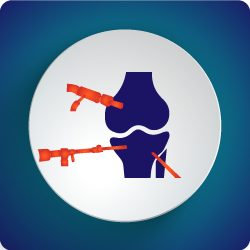 A knee arthroscopy is used to diagnose and treat a variety of conditions within the knee joint. The knee joint is a synovial joint, composed of the ends of the tibia and femur bones. These bones are capped with cartilage. This in turn, is separated from one another by a highly specialised piece of cartilage called the meniscus. The meniscus acts as a shock absorber in the knee, and also guides the normal gliding and rotating movement of the knee as it bends. After an injury, the knee can be injured due to tears of the cartilage, meniscus, or ligaments. These often need to be cleaned up or “debrided” in order to regain the normal function of the knee. Due to the fact that cartilage and the meniscus is avascular (has not blood supply), only the bare minimum should be removed, as it does not grow back. Knee arthroscopy is a very good, minimally invasive method, used to address these intra-articular injuries. Unfortunately, knee arthroscopy cannot fix anything outside of the knee joint. This includes the quadriceps tendon, lateral and medial collateral ligaments and bone outside of the synovial cavity. Another reason for a knee arthroscopy is a suspected knee infection, or gout. When the diagnosis of a knee infection is possible, it is best to have the knee washed out, often several times in order to decrease the bacterial load in the knee. This a relatively urgent procedure as bacteria degrades the cartilage over time. When fluid is removed from the knee for testing in suspected infections, it is only positive in a proportion of time, and can be incorrect. For this reason, a knee arthroscopy is used to remove actual tissue from inside the knee (synovium) which yields a much more accurate result. When the knee is known to be infected, it often takes several washouts to clear the knee fully from infection. This requires the use of the correct antibiotic as well, which acts to remove the last few bacterial cells that the washouts are unable to remove. In the case of infection, it is best to seek orthopaedic consultation without delay. Knee arthroscopy is a highly versatile and useful procedure with minimal risk. The main risk of a knee arthroscopy is causing an infection. This is very rare in fit and healthy individuals. For more information, please contact your GP for a referral to see Dr Chien-Wen Liew to determine if a knee arthroscopy is a suitable treatment option for your knee condition. All appointments to (08) 7099 0188.